Take a peek at these creative WordPress themes for artists and designers and you will be surprised that a template (which is preliminarily orientated to the needs of the majority) could be so unusual and unique. Do not hesitate and let your website be creative! Coral is a creative WordPress theme with an original design, 16 different skins and a stunning main page accordion. You can choose from 4 different homepage featured sliders and from 7 Cufon fonts with an option to link your own font through the theme options. 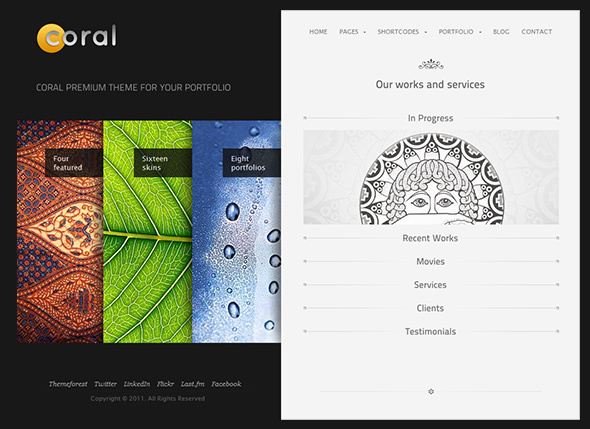 Coral theme has 8 stylish portfolio styles and many template pages (including 404 Page). A bunch of useful shortcodes and PSD files are also provided. A great bundle of files for any designer. Da Vinci is a highly creative one-page WordPress Theme. It comes with 12 premium skin options. Also, you can easily create your own skin using PSD files, which are included for all of the 12 skins. It has plenty of amazing features to present your creative work: animated scrolling, header slider, vertical scroll modules, overlay window, multiple image cross fade function, etc. Da Vinci theme also includes Cufon font replacement, Ajax PHP contact form and AddThis sharing platform. 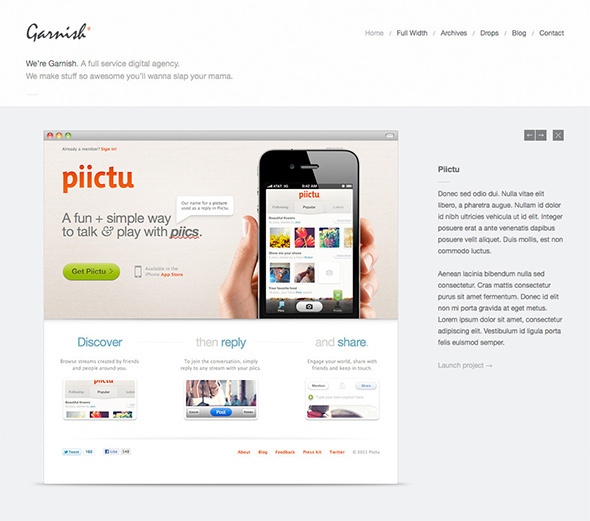 Mosaic is an exceptional and beautiful WordPress theme aimed at designers, photographers or other artistic individuals. It features unlimited number of galleries, automatic Lightbox for all fullscreen gallery images, automatic grayscale imaging and image sizing. It also includes multiple image uploader and many more functions allowing you to showcase your work in an amazing way. Mosaic theme is also widget ready and includes Twitter widget, Google Maps widget, Flickr widget, etc. Space is a high quality WordPress theme with a unique layout. This theme is distinguished by high flexibility and is powered with WizyPanel. You can choose from 9 different color options, use 6 custom widgets and over 20 useful shortcodes, such as tabs, sliders, twitter, flickr and collapsible content. Space theme features Ajax powered contact form and has 4 different portfolio layout options. 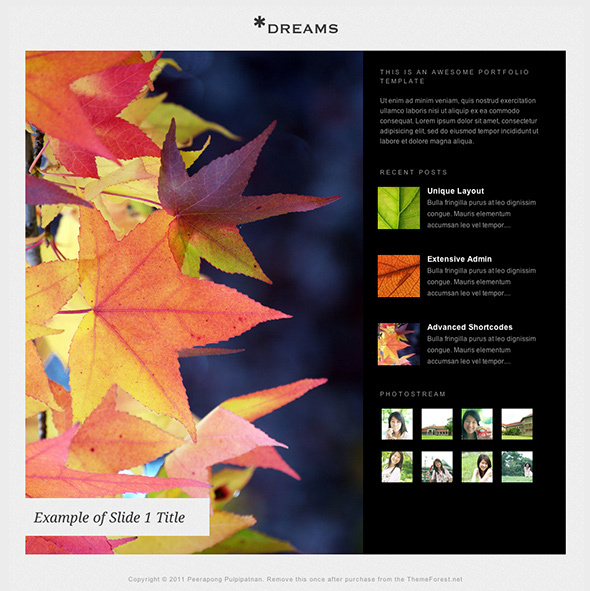 Dreams is a minimal and creative WordPress theme with a unique vertical slider for your home page or portfolio. 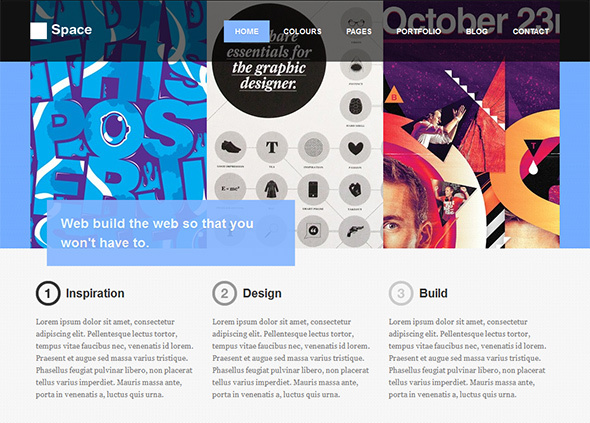 This theme features styled typography and flexible page columns. 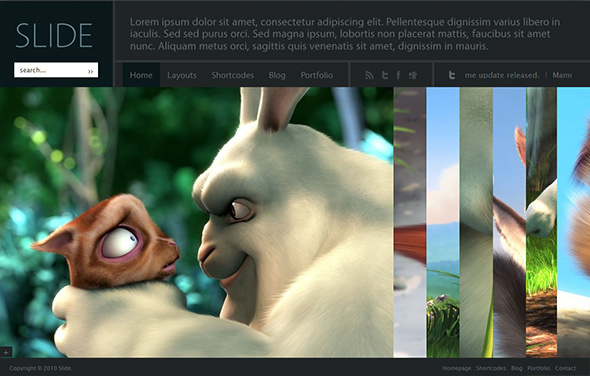 It comes with 2 different jQuery powered portfolio page styles and 8 custom widgets. It has many useful shortcodes and unlimited sidebar. PSD files are also included. Galactic WordPress Theme is a creative professional’s dream. It was inspired by popular font “Vador” and gives you 3 different preset theme styles. 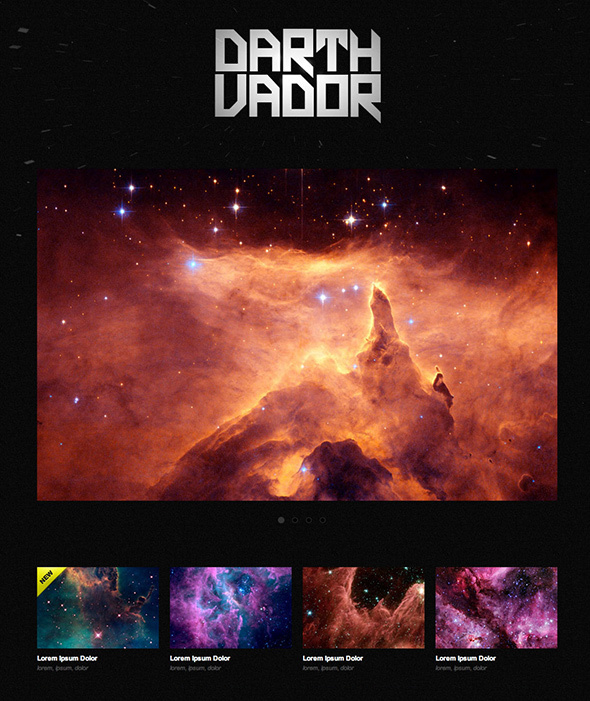 Galactic theme has a great homepage slider with 16 unique transitions. It also includes a custom admin panel, 3 custom widgets, 3 page templates, a custom contact form and CSS styling for supported WordPress plugins. Slide is a creative WordPress theme perfectly suitable to represent your own artistic work using stunning sliders. This theme also comes with over 40 shortcodes; hence, you can customize each page as you want. Slide theme supports YouTube, Vimeo, Flash and HTML5 video files in the slider, shortcodes and lightbox. It has 6 different skins, unlimited sidebars and features for easy language translation. Imbalance is creative and free WordPress theme designed with a contemporary modern vibe in a minimalistic style. It is an excellent choice to represent your artistic work. This theme has a custom homepage, flexible layout, clean typography that makes your website easier to read and a stylish jQuery powered header with special drop-down menu. Imbalance theme is search engine optimized and has logo customization options. Garnish is an original, clean and simple to use WordPress theme. The uncluttered, one-page, Ajax powered portfolio is perfect for designers and artistic individuals. Garnish theme comes with clean-cut minimal design with dark & light color schemes. It supports many post formats, so you can post images, quotes, links, videos …whatever you want! This theme also includes layered PSD files for an easy customization. FolioFlip is a creative WordPress theme with an original image flip slider for all your portfolio categories. It was created to be very easy to maintain and you can use this theme as a portfolio and blog or just a portfolio only. FolioFlip comes with 3 different color schemes to choose from and has 2 multi-level navigation menus. It also features Cufon font replacement, customizable home page slider and sidebar widgets. Stuff is an amazingly creative WordPress theme with a unique horizontally oriented design. It lets you display page content in smart columns and has 12 different color schemes. Stuff theme is powered with Ajax content loading, video support and Cufon font replacement (custom font included). This theme comes with 2 portfolio and 2 page templates, custom social media graphics and layered PSD files. Art Gallery is a creative WordPress theme dedicated to showcase your art, photography, design work or even print. 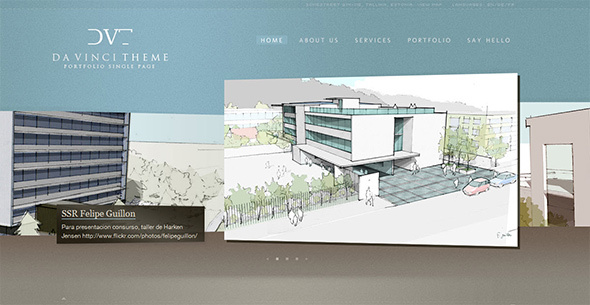 It is a one-page template with an out of the box horizontally animated (jQuery powered) design. It is built on a Fuse framework; hence it gives you almost unending possibilities of making changes using massive back end CMS. 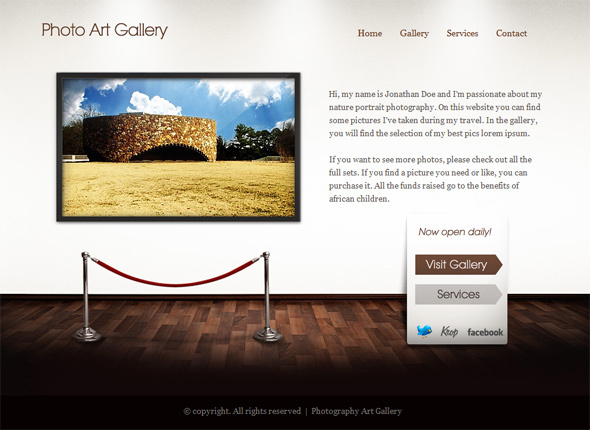 Art Gallery theme also features Cufon text replacement and dynamic sidebar widget creation. Helious is a creative WordPress theme built with the latest WordPress features. This theme comes with 2 (light and dark) skins and a font manager, so you can upload your own fonts. Helious theme features 7 custom widgets, fullscreen image gallery, unobtrusive jQuery powered effects, style and media shortcodes, plus built-in shortcode generator plugin. Also, you can create or select a sidebar for each page you want. 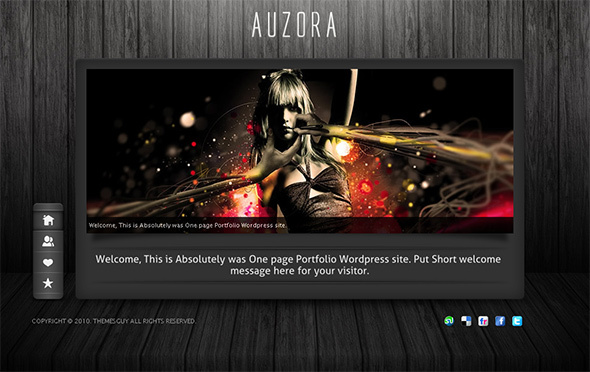 Auzora is a great one-page WordPress theme. It comes with massive admin features and has a completely different effect when changing the page compared to usual scrollable effect. Auzora theme has two color schemes and a unique menu where you can place your own icon for each page. It supports video as portfolio items, has many useful shortcodes and a built-in Ajax contact form. PSD files are also included. 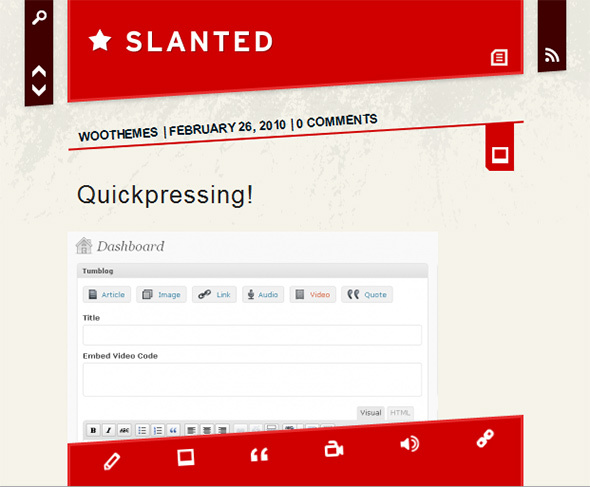 Slanted is an extremely unique tumblog WordPress theme with a literally slanted design. 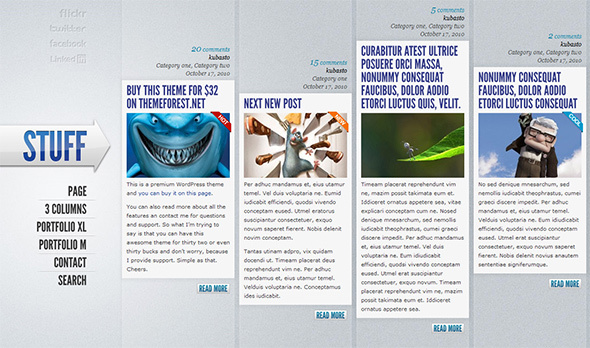 This theme has an extensive multimedia support, which makes posting images, video, audio, quotes, notes, links and other multimedia elements super-easy to do. 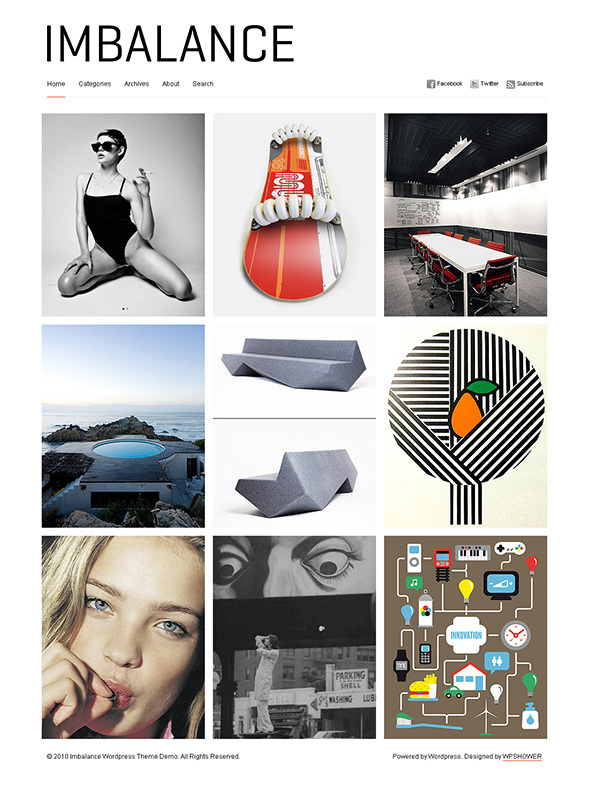 Slanted theme supports the Express App for iPhone, so you can post while on the go. It includes jQuery navigation and hotkeys that makes scrolling and navigating so much fun. Also, you can choose from 10 different color schemes. Thank you for compiling and sharing this visually very sleek & modern looking list of portfolio themes. Especially since you’ve selected themes that allow a lot of back-end customization & functions out of the box that many other nice looking themes will have you create a child-theme for. If I may, I’d like to mention Nilmini and Yoko from elmastudio.de Clean sleek and classy, translate well to mobile. While these are not heavy on portfolio options (more for single image blogging per post) they are excellent for sketch-blogging! What A Collection Of Creative Design. Its Really looking Great. Some great artist WordPress Themes. I’m starting a new site for a local artist soon and may use one of these themes as inspiration. The main problem with artist websites is protecting copyright – placing watermarks and disabling the ability to copy their work. I’ve seen some great WordPress plugins to help with copyright protection but nothing seems to work completely. yupz…i agree….that’s very artistic themes….